Blue Line (Samuel Morgan) Ltd. Yet another Independent bus operator from the Doncaster area, the Samuel Morgan part of the name is from a take over in 1930, Samuel Morgan operated under the name of Gwen Motors. 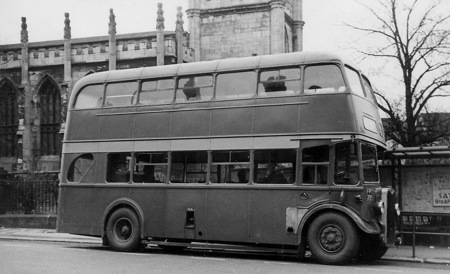 The above bus was not new to Blue Line it was originally owned by Sunderland District and was number 176 in there fleet until 1961 when purchased by Blue Line. Of course with a build date of 1943 it would of had a utility body, not sure who built the original body but it was rebodied by Roe in 1953, if you know leave a comment. Blue Line also owned Reliance who they took over in 1949 and carried on running it under its own name they also had an ex Sunderland District Guy Arab II registration FPT 207. I can remember the 2 old guys known as 205 & 207. One had a conventional 4 speed Westlinghouse crash gearbox the other a so called Chinese gearbox where 1st gear was where 3rd should be and 2nd where 4th should have been this could cause all sorts of gear grating if you forgot which bus you were driving. I know the feeling only too well David – the two Guy Arabs that we had at Samuel Ledgard (JUA 762/3) had the "back to front" gearboxes and often caught out the less interested among the driving staff. They were fitted with dark maroon knobs on the gear levers – a somewhat optimistic method of alerting drivers, especially in the dark !! I think I read somewhere on the net that the above bus came to a sorry end, on its side in a field, having got too close to the ditch at the side of the road, no one injured. London Transport also had a a sizeable number of austerity Guys with both reverse and conventional gearbox ‘gates’. If my memory serves me right, they got over the problem by sawing 2-3 inches off the non-standard gear levers. No problem in the dark, but whether the drivers got backache from bending to the left with every gear change is not recorded! Regarding Spencer’s note above, here http://www.flickr.com/photos/8755708@N07/4423130081/in/photostream/ is a set of pictures showing the accident and recovery operations. It was the end of it’s life but reading that the others like it were withdrawn in 1968 and noting that the Honda Cub moped carries a 1967 registration, it probably only hastened it’s demise by a short time. There are some nice pictures in the series contained in the link. I was once a member of the now defunct Spenborough Bus Enthusiasts Club in Cleckheaton and we organised a trip in a similar Roe bodied Guy Arab of Yorkshire Woollen District to view the Blue Line Arab. Somewhere along the way in Doncaster a wrong turning was taken and a low railway bridge was encountered which entailed a long reverse manoeuvre. I recall the drivers name was David Rothery last heard of at East Yorkshire Motor Services. I wonder if anybody else can remember the trip. It was in the early 60s.